Make sure the selector is actually selecting what you want selected. I can liberally apply rule number one before fiddling with event handlers and method calls that come later, because it’s easy to do and saves me time. Step 2: Type your opening selector in the command bar of the console. If you need to take a look at the objects you’ve selected, then a little console logging inside FireBug goes a long way. I hope this tip saves you as much time as it has saved me! Just a heads up - make _sure_ you remove the console.log(...) from all of your scripts before releasing. 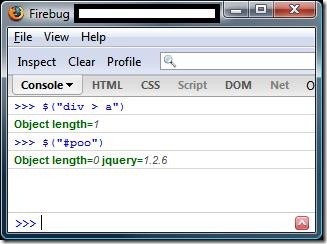 That script is dependent upon the users browser having firebug installed; if firebug is not installed script will break. Seems pretty obvious, but I have seen this happen in the past.